What is a chitterfleet, you ask? This is the same question I asked for years. After much thinking, I came to believe that the chitterfleet was either a rare fish or exotic bird that sparkled beneath the waves. I mean honestly, Bono has traveled more than most, and so I figured he, of all musicians, deserved a unknown species reference to school us regular citizens on how lovely the world is. In my mind, chitterfleets were endangered, and Bono was out to save them. Clearly his last refrain of “ow” at the end of the phrase meant he felt for this species and that without the chitterfleets, the very day he was describing might be a little less beautiful. Furthermore, without their glitter and hope of survival, he wouldn’t have anything to sing about. So imagine my surprise when I discovered that no, instead of a mythical and magical animal, Bono decided to let us observe tuna. TUNA. We’re talking about the canned concoction that made everyone else turn up their noses at the elementary school lunch table. Is this beautiful, Bono?! I mean, I know Planet Earth in HD makes us all excited to live on this world, but is tuna really the picture you were going for? Are tuna really that majestic? Did Starkist pay you a little somethin’-somethin’ under the table to give tuna a new rock and roll image, further saving their company? C’mon! 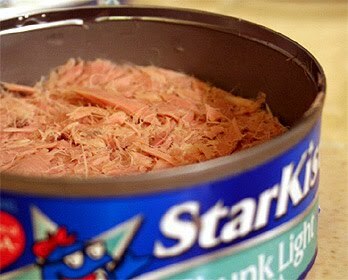 Is tuna swimming around, trying to avoid the canning industry, really that gorgeous? Really, Bono?! YOU COULDN’T GO WITH COLORFUL CORAL? OR STARFISH? OR EVEN THE BEAUTIFUL PATTERN OF WALLPAPER IN MY BATHROOM?! But, I digress. For whatever reason, Bono went with a common household pantry fish. And maybe he finds beauty in such simplicity. Maybe if we were all to stop being so ridiculous with our metaphors, the world would look a little better. Honestly, I’m in no way denying that each day has the potential to be beautiful and that beauty is everywhere, I’m just sad one beautiful creature is no more. Goodbye Chitterfleets. I know that according to the same song, we don’t have you in the world, so we don’t need you now, but I will miss singing about you and thinking about what you could have been. Rest in peace, mythical creature. I’ll never forget you and still sing along with your name as a lyric. This entry was posted in Uncategorized and tagged misheard lyrics, music, U2. Bookmark the permalink.